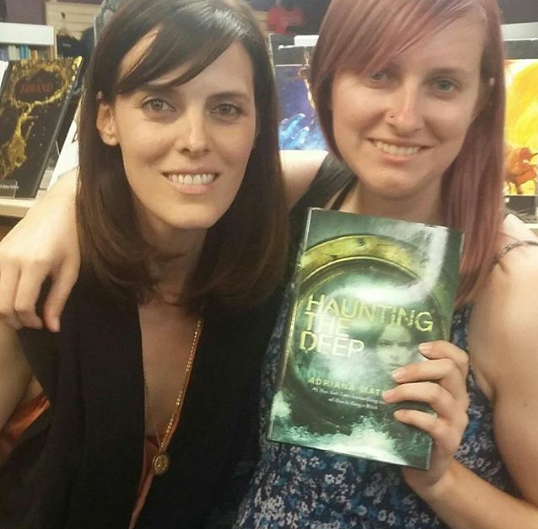 When I first saw arcs of Haunting the Deep floating around on social media I had no idea it was a sequel, but the title and cover had me intrigued. So I looked it up and found it was the follow-up to How to Hang a Witch, which I’d bought on my kindle the year it came out but hadn’t gotten around to reading yet. The first thing I noticed was that the author shared a last name with the main character, Samantha Mather. This had me wondering if the book were some sort of autobiographical account of the author, or a relative from the author’s weird, paranormal past, so I turned to the author’s note at the back of the book. It turns out Adriana Mather has quite the family history; she’s descended from relatives who started the Salem witch trials, as well as some survivors of the Titanic. Upon coming across some old family relics -including a stack of letters from the Titanic-in her grandparent’s house, she became interested in her own lineage and did some research on her ancestors and the history of Salem before writing her modern day paranormal duology. 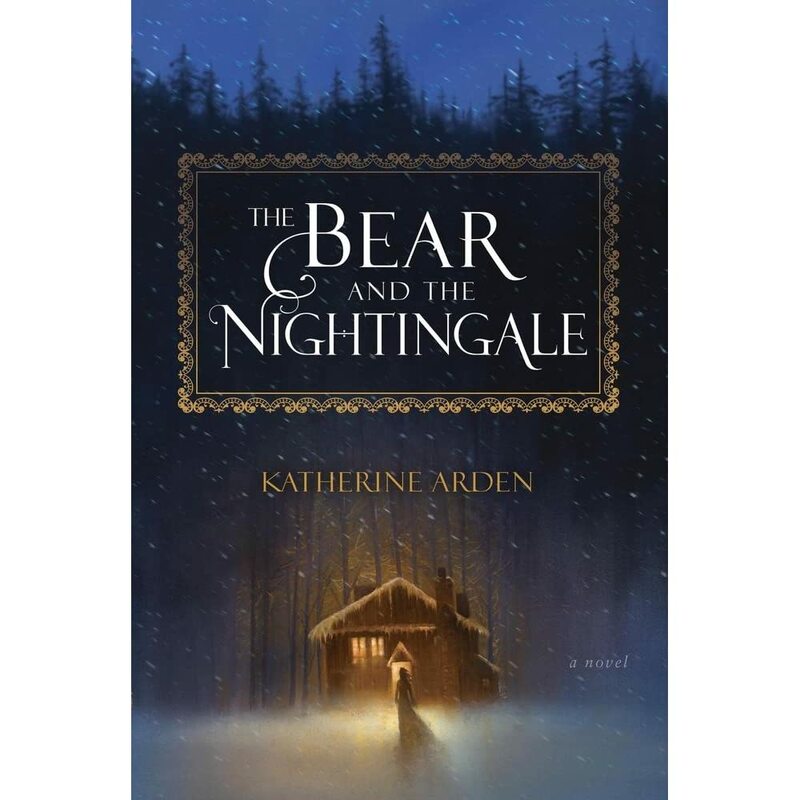 After reading and thoroughly enjoying How to Hang a Witch, I was eager to return to Adriana’s magical and haunting version of modern day Salem and see how she wove more of her family history into Samantha’s story. So naturally, I was super excited when the publisher agreed to send me a review copy and asked me to participate in the blog tour. Thank you so much to Margret Wiggins at Knopf publishing for sending me a copy! 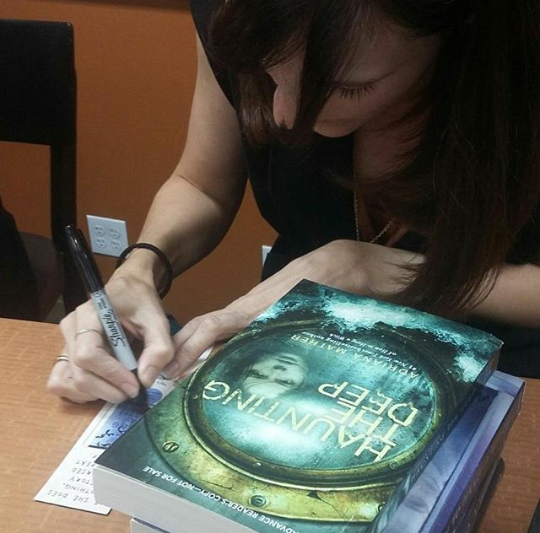 Haunting the Deep follows the events of How to Hang a Witch, in the aftermath of Samantha Mather’s narrow escape from a deadly curse. Sam thought she’d left her ghost-seeing days behind her, so she’s unpleasantly surprised when early nineteenth century ghosts suddenly begin appearing at innoportune times. Then she begins to dream of being aboard the Titanic, not just as an observer, but as a passenger, to whom the people and the ship all seem so impossibly familiar. To add to the eeriness of it all, articles of Titanic era clothing start appearing on Sam’s doorstep left by an unkown person, and the upcoming school dance just happens to be titanic themed as well. There were many new developments I was happy to see in Haunting the Deep. First was her relationship with the Descendants; the group of girls at her school who are descended directly from the witch trial victims. In How to Hang a Witch, they started off enemies, due to their suspicion and mistrust of Sam because of her reationship to Cotton Mather, the man behind the 1600’s witch trials fiasco. In the aftermath of surviving the curse together however, they came to trust Sam, and In Haunting the Deep they’ve even grown to become friends. Susannah, Mary and Alice are determined to help Sam break this new curse and the way they look out for her is admirable. I absolutely love when female characters go from enemies to good friends who look out for and care for each other, so this was something I was really happy to see. Her friendship with Jaxon is more solidified too, although it became frustrating how often their lack of communication led to fights and a slight loss of trust between them. I wanted them to quit arguing so much and rely on each other more. I mean, all they had to do was talk to each other and so much grief could have been avoided! We also get to see Sam’s relationship with her dad for the first time since he got out of the hospital. Sam and her dad are each other’s only remaining family members after Sam’s grandmother died, so the two of them were very close and I found their connection very heartwarming. It was clear that they’d been through a lot together but still remained strong and maintained a tight relationship. There was also the return of a character from How to Hang a Witch that I thought we’d seen the last of, who returned to help Sam and her friends get to the bottom of the Titanic mystery and uncover the secrets regarding the sudden appearance of the unfamilar ghosts. It was someone I was very happy to see more of, someone who I had really missed! I love books with witchcraft and ghosts, so I was really pulled in by the magical and ghostly aspects of the story as Sam and the Descendants performed spells and rituals to communicate with the dead, trace origins of cursed objects and break numerous curses. I’d love to read more books with Salem as a setting. It’s such an interesting place to read about, with so much dark history and old houses and relics that make it feel almost frozen in time. Adriana perfectly captured that feeling and the Titanic flashbacks felt very authentic and atmospheric as well. If you’re looking for a book that’s a little creepy and mysterious but not too heavy, Haunting the Deep is perfect read! It’s pretty light hearted despite all the dead people and curses and witchery, I promise. I also had the privilege of meeting Adriana Mather just the other day! She talked about some of her creepy encounters in Salem and talked a little more about how her family history inspired her books. 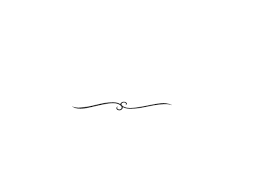 Goodreads Synopsis: A heartrending but ultimately uplifting debut novel about learning to accept life’s uncertainties; a perfect fit for the current trend in contemporary realistic novels that confront issues about life, death, and love. 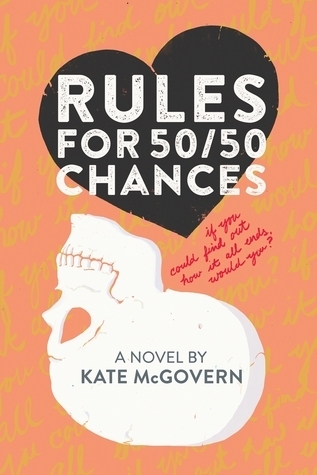 Review: Rules For 50/50 Chances was an eye opening read about what it’s like to live with a family member who has a very rare yet extremely debilitating illness, and the fear that comes along with knowing that you could possibly inherit it yourself. Rose’s mothers illness has taken a toll on her entire family-and rather than her mom taking care of her, Rose has to instead take care of her mom, and the reversal of roles has put a definite strain on their relationship in the last 3 or so years since her diagnosis of Huntington’s. It was obvious how frustrating and difficult it was for Rose to remain patient with someone who had very little control over her motor skills-she sometimes said inappropriate things at inappropriate times, was increasingly moody every day-snapping at everyone for everything even as they tried to help-and some days she could barely lift a spoon to her mouth. Having to watch her mothers mind slowly deteriorate has Rose feeling pessimistic about the future. With a 50% chance of developing the disease herself, is it even worth it to pursue a career in ballet? Ballet is the only thing she’s ever dreamed of doing, but she knows that if she does have Huntington’s, her dream will be short lived, and she already dreads the loss of being able to dance and move, of having control over her body. She becomes paranoid, seeing possible symptoms of the disease in every part of her life-every time she trips, she wonders if she’s simply clumsy, or if it’s an indication as to what’s to come. The unanswered questions drive her to seek answers, no matter the possibility of negative consequences. Despite warnings from friends and family, Rose decides to take the test the find out whether or not she carries the gene, as soon as she turns eighteen. She struggles with this decision throughout the book-is it best to know now how her life will turn out? Or is it better to keep on living her life without worrying about the future? As she struggles with her anxiety regarding the future, she finds herself falling for a boy she meets at a charity walk for rare diseases. With a mother and sisters suffering from Sickle Cell, Caleb knows some of what she’s going through. Although she’s determined not to fall in love and possibly burden someone with a life of taking care of someone with a debilitating illness, she finds herself imaging a future with Caleb despite all her efforts to keep him from getting too close. He was persistent, and as their friendship turned into something more, Rose began to open up to him more and more. Although not exploding in passion, their romance is sweet and realistic, as both of their family situations led to uncertainty and doubt as to whether or not the baggage they both carried was worth pursuing a relationship. I was also satisfied with the fact that this story contained an interracial love story, because diversity is something that can be very hard to find. It brought up a lot on the topic of racial discrimination and the advantages of white privilege. Rose’s obsession with worrying over the future begins to negatively impact her relationships as she pushes people away, letting fear cloud her common sense. Is everyone right in trying to keep her from making such a permanent life-altering decision regarding her future? Overall, a very honest read, and I promise it’s not as dark as it may sound, it was relatively light-hearted and heart-warming as well. It was a bit slow at times, Rose seemed to get lost in her own head a lot and sometimes she was frustratingly negative, but this story is still definitely worth reading. Let me know if you enjoyed it as well!